i can’t use the local bypass. It says activation server cannot be reached. I don’t have proxy enabled. Any ideas? Thanks! sir please tell me how to use this server .i install ur tool now next what i need to do..reply me sir please..
i can’t get the home screen. use emoji port 888 and 9999. keep saying could not activate iphone. working very good on first try, just need a few minutes. then turn off because the battery runs out. i try again with same way, but not working anymore. i try to reboot my phone nothing changes. Server was under DDOS attack. Now it should works fine. thank you sir. now it works. I’m a little stuck. I’m at the part where your suppose to unlock and choose language for 2-3 minutes. But I’m confused with what ‘finally be booted to home screen’ is the home screen the hello screen? Will I see my iPads picture background? Please help me out. I appreciate your amazing work and generosity with this site and will be donating soon. Thank you !!! Hi I’ve been using your server for months on my locked iPad 2 and it isn’t working anymore as of today. Is the server down? is not posiible por my iphone 42 7.1.2 in venezuela.. i can proved any steps and not found, were is the problem? the bypass is no more working i think cause i try even the tool for pc it does not work for me. What ever you do. Don’t put a passcode on the bypassed device. You’ll never be able to use it again. Thank you so much! I have activated a 3rd and 4th Gen iPad and will subscribe when you are ready. I hope people realize what you have done and realize that this is a step away from Apple. Sir, what’s the next step on Local iCloud Dns Bypass Server? I have Iphone 5s iOS 8.1.2, I can’t make it to the menu window. Turn off proxy server. Look at screenshots. yes sir thank you very much for this server. 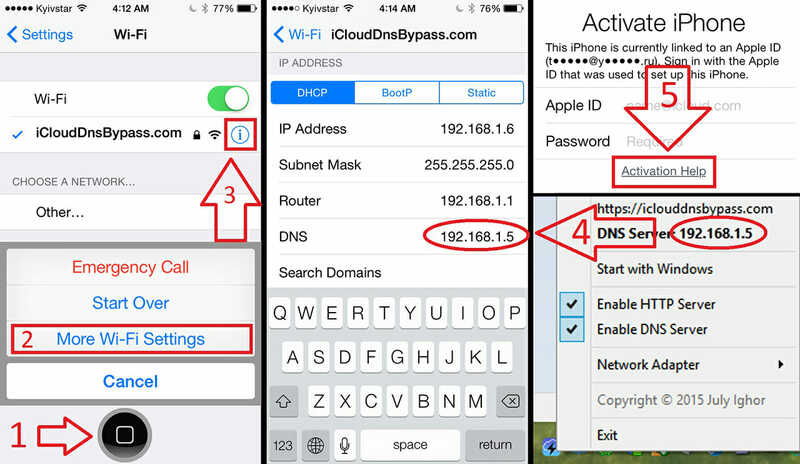 Click on Help menu item and choose “How to use iCloud DNS Bypass Server” article, there are photos which shows how to use the server. Hi je peux t’envoyer l’argent pour débloquer mon iPhone 4s ça marche ?